As a part of its efforts to preserve and promote our Japanese heritage and to advance the commitment to community service, the JASC administers an annual scholarship program to support members of the Japanese American community to pursue education beyond high school. 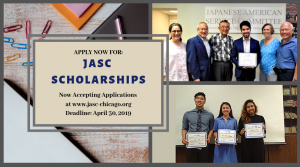 These JASC scholarships are intended to provide financial assistance to promising students who have demonstrated both academic excellence and service to the Japanese American community. We thank the many families and individuals who have donated to fund the scholarships and recognize the people who whom our scholarships have been named, both current scholarships and past: Sam Fukaye Scholarship, Fred Toguri Scholarship; William T. Yamamoto Scholarship; Frank T. Kambara Scholarship; Jean E. Taketoshi Scholarship; John (Jun) Iwaoka Scholarship; Dr. Newton K. Wesley Scholarship. High school applicant’s family must have a current JASC Family membership; current undergraduate or graduate student must have his/her own current Student or Individual membership. Applicant must be a high school senior and enroll on a full or part-time basis in an accredited school of advanced learning within one year of being selected as a scholarship recipient OR be currently enrolled as a student in a college or university. Applicant need not be of Japanese ancestry and need not be a citizen of the United States. Applicant must submit a written Application based on the Criteria listed below along with a current transcript from their high school or college/university. Awards to high school students are contingent upon the applicant timely providing the JASC with a notice of acceptance by an accredited school of advanced learning. Past recipients of JASC scholarship awards are not eligible to apply. Grades, Coursework: Submit current transcripts from your educational institution. Extracurricular Activities: Level or degree of the applicant’s participation, length of time the applicant has been involved in the activity, leadership, and accomplishments in the activity, etc. Essay: A one-page essay on either of the following topics: a) How can JASC be relevant to the applicant’s life? or, b) How has the JASC contributed to the applicant’s sense of self or personal growth? Download JASC 2019 Scholarship Application here. 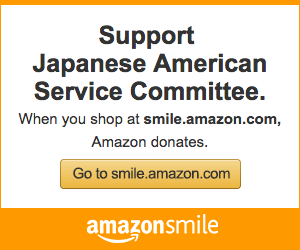 Service to and participation in JASC and other Japanese American community events, programs, and projects. While grades are not always indicative of ability, good grades or steady improvement of grades over the course of high school, suggest the student takes his/her education seriously. Grades will be considered as a measure of the student’s interest and seriousness. The student’s coursework and course levels will also be reviewed as an indication of interests and motivation. Extracurricular activities are an important part of growing up and toward that end will be considered in evaluating an applicant. Considerations will include the level or degree of the applicant’s participation, length of time the applicant has been involved in the activity, leadership, and accomplishments in the activity, etc. Deadline: All completed application materials and transcript must be submitted by 5:00 PM, on Tuesday, April 30, 2019; to the Japanese American Service Committee, Scholarship Committee, 4427 North Clark Street, Chicago, Illinois 60640. Incomplete applications or those delivered after the deadline date will not be eligible. Decision of the Scholarship Committee is final, and applicants will be notified on or by Friday, May 31, 2019. Award recipients are expected to attend the award ceremony at JASC on Monday, June 24, 2019; families are invited.